What are the Pressing Questions on Integrating Faith and Economics? As I continue researching the integration of faith and ethics, I am faced with a complexity of issues and activities on the fronts of morality (determinative of motivations and informing ethics), ethics (as the outworking of morality, i.e., what is or is not appropriate behavior), diversity (both the broad range of activities and in theological explanations), and so on. But, I am most curious about what marketplace Christians perceive to be the most pressing questions pertaining to their understanding of why and how we experience or pursue the integration of our Christian faith and our economic activity, whether in employment, in mission / missions, personal and corporate spending and investment patterns, etc. Most of us recognize this is an important topic, especially given the globalizing of economics and the volatility of economic instability and economic injustice. So, I throw the conversation open and ask: What are the pressing questions on integrating faith and economics? One of the hardest things for many Christians to understand is that once we “give” our life to Christ (as if God did not already own us–Psalm 24:1), how do we know what steps to follow or His plan for us or how to discern God’s will? In the West we have largely focused in recent history on personal salvation. We are saved individually. But the Bible is clear that we are also saved into a community and into a purpose. Both are lifelong commitments that serve God, serve others, and serve ourselves. Humankind, male and female, were created in the image of God (Genesis 1:27). As a reflection of the Trinitarian community of God, Adam was given a partner, called a helpmate (for the division of labor) and wife (for the perpetuation of the species). They had a new community in an ideal setting. Their provision was available and, by comparison to after the Fall, their work was not stressful or laborious. The Fall, that is, Adam and Eve’s choice to disobey God, cast a pall over all of humanity and the rest of creation. Being put out of the Garden of Eden launched the largest project in the universe after creation: the mission of God. In theological parlance, that is known as the Latin missio Dei. It is what the rest of the story of the Bible is all about. Christopher Wright contends that God launched His mission with the choice of Abraham as the spiritual father through whom all nations would be blessed. But the coming of Christ, the seed of Abraham, was also the seed of Adam and Noah and every other generation that preceded him in his temporal lineage. The prophets also called Jesus the Son of David. The mission of God was in motion in the mind of God from before even creation and progressed according to His plan. Wright has done the church and the world a great service in writing a book, simply titled The Mission of God. I promote it with the warning…it is comprehensive which means it is long, well over 500 pages. Fortunately Wright has a very readable style and the progression of the book is methodical in developing the thesis and what it means to us, as the church, as we pursue following Christ and ministering to the world. The development of focus on personal salvation in the past century has undermined the church’s efforts in God’s grand scheme, His mission. That is not to say that personal salvation is not important. It is relevant as we each are given a new heart, a new disposition, and a new role in the world. Many of us (all of us?) are afflicted with a broad range of maladies, whether physical, economic, psychological, or emotional. Jesus Christ offers us the opportunity to overcome all that has been passed to us generationally or done to us by varying levels of our communities, whether those be impacts from dysfunction in our families, our local communities, our cultures, or the world at-large. He even grants us revitalization to overcome the inheritance of sin passed down, as like-kind progeny, all the way from Adam. But a great deal of our personal healing comes from the realization that we are not alone. The sufferings we experience, the temptations we face, and the conditions of our lives are not uncommon. That is why Hebrews 3:13 instructs us to encourage one another daily lest we fall back into old patterns of ungodly belief and behavior. I have been burdened with my own set of issues. Many of those have been addressed and healed in Bible study, prayer, and personal discipline. Most of them have been worked out through a series of relationships with other Christians who have consoled me, encouraged me, exhorted me, even scolded me along the way. But the greatest problem I have faced is getting over myself. This life, my “calling,” gifts and talents . . . none of them are about me per se. God has created me and invited me to join Him as a son, a title I continue to aspire to through continuing the pursuit to know God and live in obedience. Hebrews is clear that I am becoming a son of God. It is a lifelong process that, like the coming of God’s Kingdom is already-but-not-yet, sealed in eternity but playing out in temporal reality. As I continue that pursuit and God continues to woo me toward Him, I become increasingly aware of His movement on a much grander scale than anything particularized to me or my life. God is in mission and we are invited to join in that movement. My particular role appears to have something to do with understanding what God is doing and why in the marketplace and in global culture in general. God’s mission is all-encompassing, turning all of human society back toward Himself and His original plan for humankind. In the research for my book, Eden’s Bridge: The Marketplace in Creation and Mission, I reached the conclusion that all these “mountains,” except family and church, fall under the umbrella of the marketplace, where we exchange value with society beyond the household walls (natural family) or the fellowship of the church (spiritual family). Whether it is the exchange of ideas and information (education and media), opportunities for self-expression (arts and entertainment), or matters of law (government), all these contribute to establishing (for good or ill) the order and well-being of society as relational interactions. Historically these activities were largely carried out in common (shared) public spaces such as the town square, or at the city gates or the threshing floor. All these, in my mind, fall under the marketplace umbrella because they are inextricably linked in the economic formation of society. Borrowing from Bright, Hillman, et al, I created the chart below for my own thought development. I was able to see their priority statuses of each institution given what they provide each of us. I modified the original listing, changing “church” to “ideology” because, as we encounter the world as it is, it is obvious that there are many other religions or philosophic systems that inform morality and ethics. 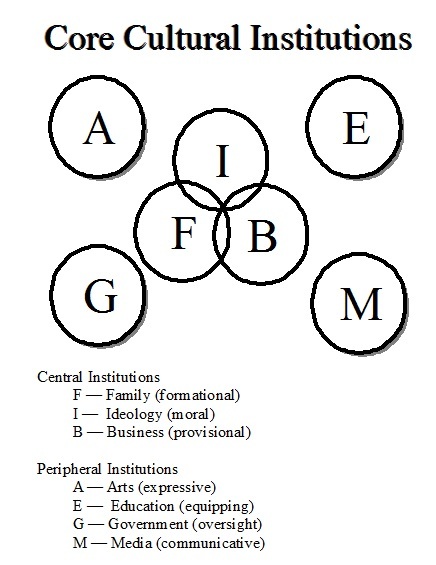 The three “mountains” that I classify as Central Institutions are those that were created in the natural order of the Garden of Eden–family (Adam and Eve in procreative relationship), worship (walking with God in obedience), and business (mutually beneficial exchange for communal provision). * But all seven institutions are on God’s radar in His mission of the redemption of all creation. Christian workers in all these arenas play a part in carrying that mission forward. The challenge for the church today is to inform marketplace Christians as to their roles and responsibilities as vital to God’s mission and to release them from the false bifurcation of secular vocation and sacred calling. How does your vocation and how you do your job carry forward that movement? How do your work and work ethic reflect and glorify God? What can you do to “redeem” your industry, your workplace, your position to bring God’s Spirit, in power and truth, to bear in all the relationships touching your career? It is a challenging question and one not easily answered but one that must be raised: when you go to work, or to the market, or to take in entertainment, or pursue education, or vote . . . are you on mission? In recent decades two strains of theological development have gained a significant amount of attention: the theology of work and the theology of stewardship. Both have proven important in informing us about God’s explosive movement in the marketplace, especially in the last few decades. I spent a fair amount of time investigating both these areas of concern in my own research over the past several years. But I hit a wall when I came to Deuteronomy 8:18 – “But you shall remember the LORD your God, for it is He who is giving you power to make wealth, that He may confirm His covenant which He swore to your fathers, as it is this day.” In this passage, God is reminding Israel that their economic success does not emerge from either their inherent goodness or the diligence of their work. But there is little to nothing in the surrounding text to answer two critical questions: How did God give them the ability to create wealth?, and how does the increase of their wealth fulfill the covenant God made with Abraham, Isaac, and Jacob? Unpacking that verse in an attempt to answer those questions is what ultimately led to me writing Eden’s Bridge: The Marketplace in Creation and Mission. While all this is taken up in detail in the book, I offer the following as a brief on the theological message it articulates: the marketplace is an institution of God, implicit in the creation narrative of Genesis 1–2 and vital to God’s mission in the world (the missio Dei). The first question – How did God give them the ability to create wealth? – is answered by two provisions God made for Israel – land and community. “How is wealth created” as a generic question is answered most simply by three economic components: access to the means of production, the division of labor, and advantageous exchanges between workers, i.e., trade. My quest to understand the interaction of these three, in effect, the functionality of a market economy, as a partial answer to the original question led me to the conclusion that the marketplace, as a means to create wealth (as abundance), is an institution of God. If that is so, I wondered if it was an original intent, that is, in creation or something that came later. My curiosity led me to re-read Genesis 1–2, which I had read many times before but now from a different perspective. Were those foundational components of the marketplace present in the Garden narrative? Hopefully, the reader has already surmised the conclusion that I finally reached that they are indeed. In creation, the Garden (the earth), like the land for Israel and now for all, is the foundation of the means of production. Given energy from the sun (and now through materials mined from the ground, gravity, such as tidal and wave energy, environmental energy, such as wind, and ground source, or geothermal, energy), the Garden produced all that the first family needed, not only to survive but to thrive. Adam had only to put forth what must be assumed to be a nominal effort to do well. The land, the eco-creation, is the primary means of production, and remains so even today as buildings, vehicles, electronic devices, clothing, food, and machinery are all constructed or derived from the elements of the earth. Interesting to note, at least to me, is the realization that God never commanded Adam to work. To work and take care of the Garden, rather, were part of Adam’s reason for being and in particular relationship to his physical context. “Then the LORD God took the man and put him into the Garden of Eden to cultivate it and keep it” (Genesis 2:15). To work and take on the responsibility of overseeing the Garden were, in effect, written into the DNA of what it means to be human in the sense of the purpose, at least in part, for our having been created. But this was Adam’s work . . . alone. His “calling” to work and to stewardship, if you will, was in isolation. Then God deemed that Adam was not to be or work alone, that it was not good. God did not simply create a wife for Adam to produce progeny and perpetuate the species. God first identifies Eve as the ‘ezer neged, an appropriate or suitable help mate, in Genesis 2:18. She is not identified as wife until 2:24. Not only the foundational elements of labor and stewardship were established in the Garden but the introduction of Eve introduced the expectation of the division of labor. The division of labor creates the opportunity for expanding economies. The first step is simply by making labor more efficient, dividing the tasks within a given project, whether as foundational as gathering food or complex as transnational manufacturing and marketing of goods. Efficiency gains are productivity gains, the foundation of creating new wealth as an abundance greater than can be produced alone. The division of labor, through increased efficiencies, allows for the development of specialized skills which further enhance productive efficiency within a community. Thus far we have seen that God has provided, from creation, two of the three elements critical to the establishment of a market economy – access to the means of production (land, in this case) and the division of labor (to move work beyond work in isolation). The third element – exchange – brings up being made in the image of a Trinitarian God, a self-contained community. Sadly, the only exchange between Adam and Eve given in the creation narrative is when she shared with him the forbidden fruit from the Tree of the Knowledge of Good and Evil. It is easily understood that this awakened them to the determination of their own sense of morality. It was also the violation of the relationship they had with God. But other exchanges between them are implied by the introduction of the help mate. A lone actor can be diligent and godly in both the mental and physical tasks of their work. A lone actor can also be diligent in protecting and optimizing whatever means of production, whether land, machinery, or information, is available. Hence, the theologies of work and stewardship can be taken as individual concerns. But Adam, even before the introduction of Eve, was never alone, and nor are we. He walked with God in the Garden and now we abide with a cloud of witnesses (Hebrews 12:1). For many of us, to walk with God (or even having an unseen cloud of witnesses) is largely an ethereal experience given that God is spirit and fundamentally intangible, having no body. The introduction of Eve made the idea of relationship tangible, visible, present in a real way. Adam may have been able to distance himself in his relationship with God if the Presence of God was ethereal but Eve was as real as real could be. Adam was created in the image of God but his rebellion altered that image. His rebellion changed the relationship with God, who put him out of the Presence in the Garden, and it altered his relationship with Eve. At the heart of God’s creation were two people, designed to work together as a reflection of the image of a holy God. They were designed to be holy as God is holy, that the character of righteousness and justice would dictate their relationships with God and with one another. To move beyond the theologies of work and stewardship, in fact to create the biblical foundation and the fullness of those theologies, we must come to understand the theology of the marketplace, of the interpersonal exchanges between God and humankind, within the human family, and between humankind and the environment created for our sustainability. The marketplace is the most pervasive institution in human experience. To some degree, every person is affected by economic interactions with others. At the heart of the theology of the marketplace is God’s design for human community, that we live together in mutual support striving toward the re-establishment of God’s reign in the world, that is, moral order directing and fulfilling economic, political, social, and environmental justice (though, given the multitude of directing moral philosophies, even within Christendom, how that justice works out remains somewhat open to interpretation). In no way does the Bible endorse socialistic or communistic models of governance or economics as they have come to mean in the present day. It is for freedom that we have been made free (Galatians 5:1) . . . free from the penalties of sin and death, free to worship God without encumberance from within or without, free to become as God originally intended us to be. The governmental, social, political, and economic endeavors of God’s children, however, are undertaken in obedience and response to God’s leading and goodness toward righteousness and justice, by choice rather than by the coercive influences of state or sect. Though the marketplace was established in creation itself, there was no need of profit for sustainability . . . only obedience to God. We now live in a fallen world and sustainability hinges on working with and within the world’s system to a great degree. A re-oriented view of the marketplace, in Kingdom perspective, however, may lead us to pursue restoring godliness in our relationships with God and one another and, seeking first the Kingdom of God and His righteousness, allowing God the freedom to bless us anew as we cling to His ways and priorities, even if sometimes He asks us to risk worldly security beyond our understanding. The marketplace, in God’s original intention, was a means to more than sustain us. It is for us to enjoy Him and His creation in abundance. It is for us to develop holy living in relationships. Economic discipline is vital to our survival and flourishing, all of us, and many in our world are not flourishing. Jeffrey Sachs, in The End of Poverty, points out that we have sufficient wealth to end global poverty but lack the political will. Accumulation in the hands of too few keeps too many from the basic needs of nutrition, health care, education, and economic freedom. That is why understanding God’s design and purposes for the marketplace, in creation and now moving toward redemption, is vitally important for the church and the world: because God cares for the least of these. John Wesley was concerned that Christian faith undermines itself due to the increasing wealth of adherents. As Christ-followers gave up costly vices and began to live more frugally, their wealth increased. Unfortunately, that brought new temptations of costly clothing, richer dwellings, frivolous entertainment, and so on. This is very much the conundrum facing many Christians in the West today. By global standards, many of us are wealthy. Even within our own context, many have increasingly expensive homes, automobiles, furnishings, and sumptuous meals. We have more than met our needs. We live in abundance and buy into a false gospel that says we deserve it. God chose Israel, not because they were better than anyone else, but as an isolated nation through whom He could make a name for Himself. God had been and continues to work outside Israel (and now the church), often blessing the righteous to advance His agenda of transforming the world. But wealth may be one of the greatest traps we can fall in to. We work hard, we plan and are prudent with our resources, we live well . . . and see it all as somehow something we deserve. But we thank God for blessing us for our diligence and call our part “being faithful.” But our faithfulness tends to stop at our front door. The average giving in churches in the United States is something around three per cent. Imagine the good that churches could do in their own communities and around the world if we simply adhered to the ten percent tithe. That does not touch the potential if we were to give sacrificially (the hallmark of God’s love in His work on the Cross). Acts 2:44–45 speaks of the church having “all things in common” and “sharing as anyone had need.” Right now, even in our context there are thousands of Christians without jobs. How often, and to what depth, are the members of their churches aware or addressing the needs of those families? Unemployment has dipped to about 8.5% recently. That means 91.5% are employed. Even if we double the official rate, taking into account those who are no longer able to draw unemployment, 83% are still employed. Can four help take care of the one? If we expand globally, our conviction should deepen. Our standard of living is still that to which much of the world can only dream to achieve. There are orphans in Indian and African facilities who remain unsponsored, often for as little as $25.00 or $30.00 a month to provide clothing, housing, education, and healthcare. There are millions unemployed who might be helped to build their local economies if even a small portion of Western portfolios were re-directed into small business, micro-venture funds (some even paying an annual return, albeit lower than optimizing a blue chip mix). The church is faced with perhaps the greatest opportunity in history to be a witness to the glory of God. If we can strategize how to move capital into the communities of greatest need (both foreign and domestic) while also creating mechanisms designed to improve the odds of success (especially skills training and access to pertinent information), all boats can rise. If the church will truly reach out to minister to the economic needs of its own, the world will see what Jesus said about them “knowing we are His followers by our love for one another” (John 13:35). James was absolutely right when he said that it is not enough to say “Go in peace, be warmed and be filled,” if we do not make accommodation for actually meeting their needs. Will we take all this into consideration as admonition from God to step up and begin to be the followers and church we claim to be, or will we remain complacent, underfunding ministries and outreach to those in real need while we wallow in our comfort zones? This essay will likely anger some, saying that I have resorted to manipulation and guilt. I would argue that I have only resorted to the directives of justice and righteousness of the Bible we claim to uphold and the leading of the God we claim to worship. This journey has been difficult for me. I have historically worked very hard to provide well for myself. God, in His wisdom, has chosen this season to re-direct my thinking. I have chosen recently to focus on two passages from Scripture that speak to our needs and wants. If we have any wonder why our possessions cause us so much worry and demand so much time and money to care for; if we wonder why the church in the United States is struggling to fulfill its mandate to lead social and political change; if we wonder . . . The answer is most likely that we have focused first on our needs and desires rather than seeking to glorify God, willingly living in humility and with an attitude of servitude toward God and others.